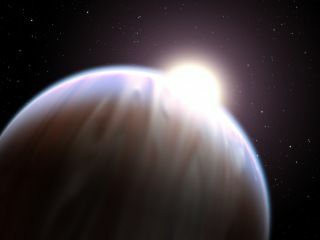 An artist's image of the exoplanet HD 189733b as starlight streams through the planet's atmosphere. Scientists are searching atmospheres on other planets for possible signs of life. The search for signs of life beyond the solar system is kicking into a higher gear. Scientists are working to compile a catalog of gases that could potentially be evidence of life, so researchers will know what to look for when scanning the atmospheres of rocky, Earth-like alien planets. "We have a shot at finding signs of life in the next decade or so," she added. "The question is, what will we look for?" Astronomers have discovered nearly 2,000 exoplanets to date. Scientists are beginning to probe the upper atmospheresof some of those worlds using instruments such as NASA's Hubble Space Telescope. As technology improves, researchers should be able to see deeper into these alien atmospheres, and with better precision. The search for alien "biosignatures" typically centers on the kinds of gases produced by Earth organisms, because Earth life is the one example that scientists have to work with. As a result, Seager called oxygen "our favorite biosignature gas." A close second is methane, she added. Astronomers can study the starlight that filters through exoplanet atmospheres, searching for signatures of molecules that may be signs of life. But there are thousands of other molecules produced by life on Earth that are not directly related to keeping an organism alive. "Imagine walking in a pine forest and smelling the smells that come off of trees," Seager said. "Those are technically all biosignatures." With the exception of the noble gases — helium, neon, argon, xenon, krypton and radon — life produces every gas available in Earth's atmosphere, she added. Living organisms may not always be the dominant method of production, but they play a role. "Pick any gas — it's made by life," Seager said. Seager and her team compiled a list of 14,000 different molecules that could conceivably be biosignatures on alien worlds. This enormous database should aid scientists as they search the atmospheres of planets around other stars. But the situation should change soon. NASA's Transiting Exoplanet Survey Satellite(TESS), which is scheduled to launch in 2017, will hunt for planets around more than half a million nearby stars. While it will not be able to detect Earth-like planets around sunlike stars, TESS should be able to identify Earth-size planets circling dimmer red dwarfs, in regions where they could host liquid water on their surfaces, mission team members said. NASA's $8.8 billion James Webb Space Telescope (JWST), which should launch in 2018, will be able to perform atmospheric studies of the rocky worlds found by TESS. Indeed, TESS should discover dozens of "super-Earths" — planets slightly bigger than Earth — whose atmospheres JWST can probe, NASA officials have said. So, if life is common and widespread throughout the Milky Way galaxy, the TESS-JWST pair should give researchers a decent shot at detecting it. Like Kepler, TESS and JWST will use the "transit method," detecting and studying alien worlds when they pass in front of their host stars from the telescopes' perspective. But a different technique, known as direct imaging, is not so dependent on such favorable cosmic alignments. As its name suggests, direct imaging refers to snapping actual photographs of exoplanets. This is tough to do, especially for relatively small, distant or close-orbiting alien worlds, but technological advances promise to extend the technique to more and more planets as time marches on. For example, an instrument known as a coronagraph can be attached to a telescope, to block out the overwhelming glare from the parent star. Just as placing your hand over the sun allows you to see an airplane flying by, a coronagraph can help scientists directly image a wealth of planets and learn more about them. Seager said NASA is considering adding a coronograph to its proposed WFIRST-AFTA mission, which could study exoplanet atmospheres, along with other tasks. Another possibility is a starshade, or external occulter, a massive, petal-shaped object that sits in space a set distance from the telescope, blocking starlight like a coronagraph does. In principle, any telescope (including JWST) can use a starshade, because this kind of light-blocker doesn't have to be built into the instrument. Studying exoplanet atmospheres via the transit method is generally limited to larger bodies such as super-Earths around dim stars. But direct imaging, including observations performed with starshades, holds a great deal of potential for spotting and studying Earth-size worlds circling sunlike stars, Seager said. "The starshade must happen," said Seager, who is chair of NASA's Exoplanet Occulter Science and Technology Definition Team.